Apache MADlib is an open source project that endeavors to adhere in all respects to the principles of The Apache Way. 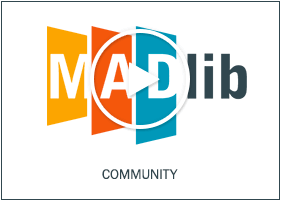 MADlib grew out of discussions between database engine developers, data scientists, IT architects and academics interested in new approaches to scalable, sophisticated in-database analytics. These discussions were written up in a paper in VLDB 2009 that coined the term “MAD Skills” for data analysis. The MADlib software project began the following year as a collaboration between researchers at UC Berkeley and engineers and data scientists at EMC/Greenplum (later Pivotal). In September 2015 MADlib was accepted into the Apache Software Foundation Incubator and graduated to a Top Level Project in July 2017. If you are interested in joining our project please consider joining our User or Developer mailing lists. Everyone is welcome. We need your feedback, so if you find a bug, would like to suggest an improvement, or create a request then please follow the steps below to let us know. Start by logging into MADlib JIRA. If you don’t have an account yet you can create one yourself. Create a new issue -> Bug. Fill in the required (and optional) fields. Create a new issue -> New Feature. Submit the issue. You should receive an email confirmation. Thanks for your feedback! Our online user forum open to discuss any topics of interest to users of the product. Our online developer forum open to discuss any topics of interest to open source contributors.